A tunicate is a marine invertebrate ainimal, a member o the subphylum Tunicata, which is pairt o the Chordata, a phylum which includes aw ainimals wi dorsal nerve cords an notochords. ↑ Fedonkin, M. A.; Vickers-Rich, P.; Swalla, B. J.; Trusler, P.; Hall, M. (2012). "A new metazoan from the Vendian of the White Sea, Russia, with possible affinities to the ascidians". Paleontological Journal. 46: 1–11. doi:10.1134/S0031030112010042. ↑ 2.0 2.1 Sanamyan, Karen (2013). "Tunicata". World Register of Marine Species. Retrieved 2013-04-04. ↑ Nielsen, C. (2012). "The authorship of higher chordate taxa". Zoologica Scripta. 41 (4): 435–436. doi:10.1111/j.1463-6409.2012.00536.x. ↑ Tatián, Marcos; Lagger, Cristian; Demarchi, Milagros; Mattoni, Camilo (2011). 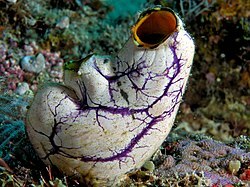 "Molecular phylogeny endorses the relationship between carnivorous and filter-feeding tunicates (Tunicata, Ascidiacea)". Zoologica Scripta. 40 (6): 603–612. doi:10.1111/j.1463-6409.2011.00493.x. This page wis last eeditit on 15 Februar 2017, at 03:29.